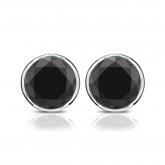 Certified 14k White Gold Bezel Round Black Diamond Stud Earrings 2.00 ct. tw. 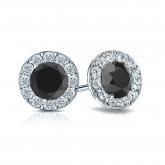 These black diamond stud earrings feature 2 round circle diamonds. These 2 carat tw. 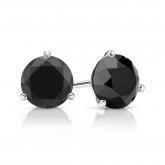 black stud earrings are a bold fashion statement with each diamond earring weighing 1 carat. Modern and trending, these black diamond earrings make a great gift. Set in a modern secure bezel setting, available with push-back, screw back or lever back clasps set in 14kt White Gold. 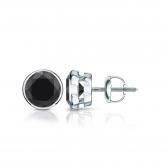 Certified 14k White Gold 4-Prong Basket Round Black Diamond Stud Earrings 2.00 ct. tw. 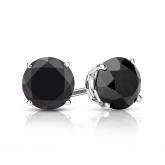 Certified 14k White Gold 3-Prong Martini Round Black Diamond Stud Earrings 2.00 ct. tw. 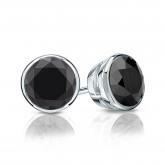 Certified 14k White Gold Halo Round Black Diamond Stud Earrings 2.00 ct. tw.